Samsung announced a new phone today, that detracted from the usual S3/S4, or the Note series range, the Galaxy Mega. Positioned as a large display smartphone, it displaces the already huge 5.5″ Galaxy Note 2 as the largest screen size offering from a Samsung. It looks similar to the soon to be released S4, which is a good thing. 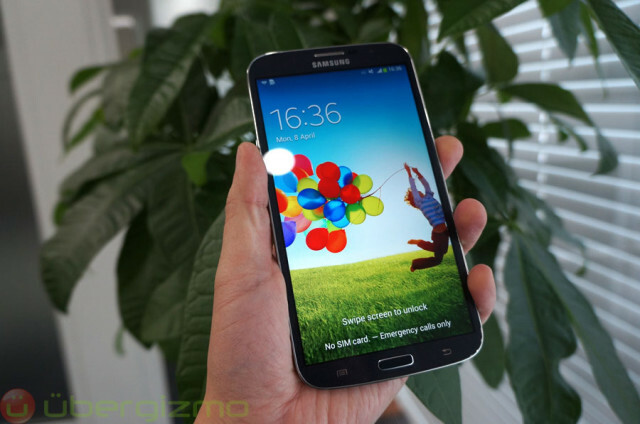 There would be both a 5.8″ and a huge 6.3″ model for the Galaxy Mega. Both sizes are bigger than Samsung’s already enormous 5.5-inch Galaxy Note 2. The phones themselves aren’t positioned at the high end tier and are pretty average. The 6.3-inch phone offers up a 720p display, LTE connectivity, 8GB or 16GB of storage, and a 1.7GHz dual-core processor. The smaller 5.8-inch model a qHD display (960 x 540), HSPA connectivity, and a 1.4GHz dual-core processor. In terms of similarities, both have IR blasters(like the Galaxy S4), an 8-megapixel camera, 1.5GB of RAM, a microSD slot, and are running the latest version of Jelly Bean. They will also, apparently, feature some of Samsung’s new software, like Air View and Pop-Up Play. Specs are still pretty decent and should fit the needs for most consumers. In fact, if you primarily just use your phone to watch shows, this would be great. Large screen, good support from Samsung, and definitely fast enough to cope with all your respective media content. The Galaxy Mega just dwarves the 5.5″ Note 2 in the photo above. Interestingly, with the 3200 mAH battery, lower resolution screen and generally slightly slower processor, the battery life is expected to be excellent. As mentioned, the Galaxy Mega is not meant as being the new high-end specs performer. Instead, it is a smartphone that was designed to maximize the utilization comfort and the productivity of key visual apps that can run very well on a dual-core processor (like email, web pages, reading, typing, photos). When it comes to large display smartphones, the Samsung Galaxy Mega is the new king of the hill. I wouldn’t recommend it if you were a male, as 6.3″ would definitely bulge your pockets, and let’s face it, with 7″ being the size of the Nexus 7, its on borderline territory. This phone is definitely not for everyone, there are people who want a slim and portable phone to bring about and to operate with one hand. Choice is always a good thing, and with large phones getting more popular, this would really stretch the market demand. In terms of availability, I don’t think we will be seeing it in Singapore anytime soon. Both Megas are apparently headed to Europe some time next month, and no news on their availability in the rest of the world. Well, till then there’s also the Samsung Galaxy Note 2 and the Note 3 that should launch by end of the year. I still think phones are getting atrociously large, but the limit and boundaries keep shifting every year. In fact, the adoption rate for large screen phones have been nothing short of amazing.